Bolivia is a landlocked country in Latin America, whose economic and cultural centers are located in remote, mountainous regions. 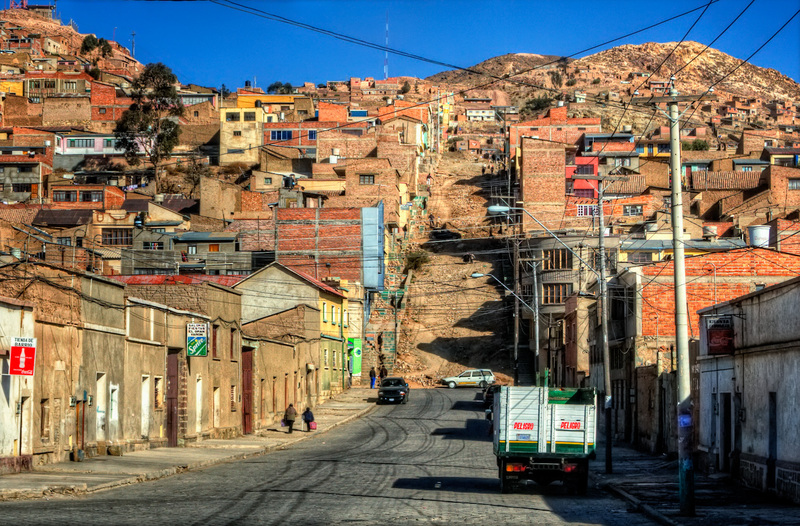 This geography has posed challenges for economic exchanges for hundreds of years, and Bolivia is one of the poorest, least developed countries in South America. Bolivia’s stagnation in industrialization can in part be explained by the geography hypothesis delineated by Armendáriz and Larraín (2017), which postulates that forces of nature are a root cause of national poverty. Although the country’s terrain has had a significant impact on Bolivia’s lack of economic development relative to other South American countries, this stagnation has been exacerbated by the implementation of state-oriented policies over the past two decades (Achtenberg). Since coming to power in 2005, President Evo Morales -- Bolivia’s first indigenous president and a member of the Movement Towards Socialism Party -- has implemented several social programs to improve healthcare and education. With increased government expenditure, the Bolivian government has found it necessary to take loans (Achtenberg). China has been willing to finance the majority of these loans over the past 12 years in what appears to be an exchange for access to natural resources and a foothold in the region. In a recent interview with Spanish newspaper La Razón, Chinese Ambassador to Bolivia Liang Yu discussed the economic relationship between China and Bolivia. According to Liang, President Xi Jinping of China and President Morales have maintained a strong, mutually beneficial relationship since 2005. Bolivia has abundant natural resources while China has advanced technology and is willing to invest in other countries’ economic development. China is Bolivia’s biggest source of imports, the country’s largest bilateral creditor, and its second-largest trading partner. In 2016, Bolivia imported about 1.7 billion dollars worth of imports from China while Bolivia exported about 480 million dollars worth of goods to China. However, the countries are working to gradually establish trade equilibrium after increased economic growth in Bolivia. Bolivia wants to harness their natural resources -- namely natural gas, petroleum, coal, and hydropower -- in order to become South America’s energy center. Chinese investment brings promises of increased total factor productivity and capital. To this end, the Bolivian government has awarded Chinese companies contracts to work on several public works projects that will help jumpstart the country’s development. There are currently over 60 Chinese businesses in Bolivia, mostly working on large projects such as improving infrastructure, increasing technology/telecommunications, increasing the efficiency of mines, and helping shape the import/export market for hydrocarbons. These companies have generated over 4,000 jobs for Bolivians thus far. Other infrastructure developments include building airports and railroads, which will increase both inter- and intra-country accessibility. The hope is that these investments will catalyze increased autonomy and industrialization in Bolivia. The other side of this story, which was not discussed in the interview, is that Chinese labor practices tend to be exploitative and that industrialization comes at the cost of destroying the environment. Bolivians have fought hard for fair labor laws and Chinese businesses undermine these practices in order to achieve greater efficiency. Bolivia’s GDP will inevitably increase with the continued extraction of natural resources, but this extraction can cause problems such as erratic climate patterns, which have already resulted in certain groups of people becoming climate refugees (Walker, 2017). This migration pattern has created “ghost towns” where there were previously thriving agricultural centers (Walker, 2017), and the inflows of people into cities can result in poor urban living conditions and overcrowding. Unfair labor practices and environmental destruction have exacerbated tensions in an already politically polarized environment, and will likely continue to do so. Civil unrest could hinder economic development, as it has for the past 30 years. If Bolivia does indeed become South America’s energy center as Morales hopes it will, this will be great for the country economically on a macro-level, but we have little sense of how it would affect people on a micro-level or how this revenue would be distributed/redistributed. Continuously taking loans from and giving contracts to China would put Bolivia in a vulnerable position where it ends up having very little control of its own economy. These are all things that the Bolivian government should talk into account when negotiating terms with China in order to avoid any negative consequences at the regional level. Bolivia’s annual real GDP growth rates have been over four percent since 2015 and China offers a plethora of opportunities for Bolivia to grow in terms of TFP, extractive industries and technology, but at what cost? Achtenberg, Emily. (10 August 2017 ). "Financial Sovereignty or A New Dependency? How China Is Remaking Bolivia". Nacla, The North American Congress on Latin America. La Marca, Arianna. (31 August 2017). "Chinese FDI in Bolivia: Help or Hindrance to National Development?". Council on Hemispheric Affairs, COHA. Vásquez, Wálter. (07 February 2018 ). "Liang Yu: Bolivia Es Un Socio Confiable Para China". La Razón, La Razón. Caroline is a junior Economics major who is also pursuing a certificate in Global Health. She has studied Spanish for 13 years and has traveled to El Salvador and Perú. Throughout her undergraduate career, Caroline has used her coursework to explore the intersection of society, health, and economics, and she hopes to go to graduate school for public health.